Trade US stocks even when you are in Hong Kong and enjoy custodian fee waiver. 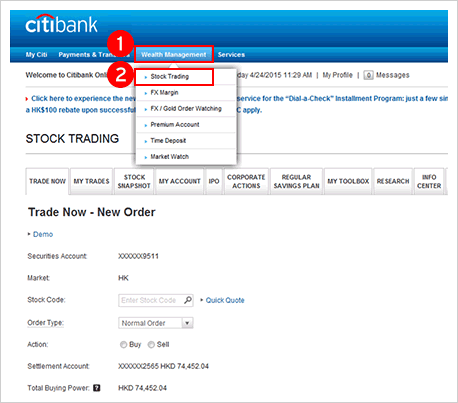 With one stock account in Citibank, you can invest and trade US stocks online or on your mobile, anytime and anywhere. Whether it's managing trading transactions or checking real-time stock prices, everything's available at your fingertips. 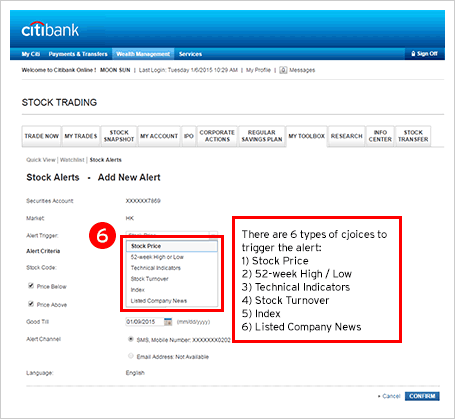 Open a stock account with Citibank now. 24 hours US stock services, allowing you to trade US stocks in Hong Kong anytime. Contact our Investment Service Hotline at (852) 2860 0222(852) 2860 0222 or visit any Citibank® branch. Stocks which can be cleared and settled by The Depository Trust & Clearing Corporation (DTCC). In-scope products (e.g. US warrants with delta greater than or equal to 0.97 at the point of issuance) under 871(m) tax withholding arrangement are not included in Citibank’s U.S. stock trading service. The US Securities and Exchange Commission (SEC) issued an order directing Equity Exchanges and Financial Industry Regulatory Authority (FINRA) to launch a Tick Size Pilot Program. Tick Size Pilot Program has been implemented and effective from October 3 2016. 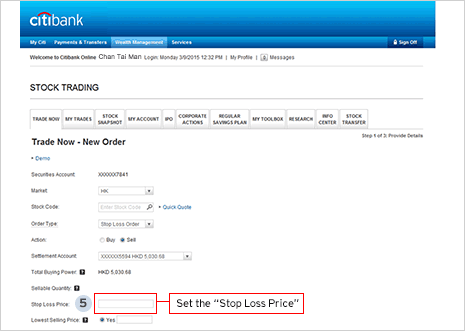 For limit orders or stop loss orders submitted before US Market open or during the US Stock trading hours, Customer must input a price in an increment of US$0.05 for buying and selling the selected US securities, otherwise, the order will not be processed. Customer should check the order status after order submission. For selected US securities list and details, please refer to the FINRA website for more information. 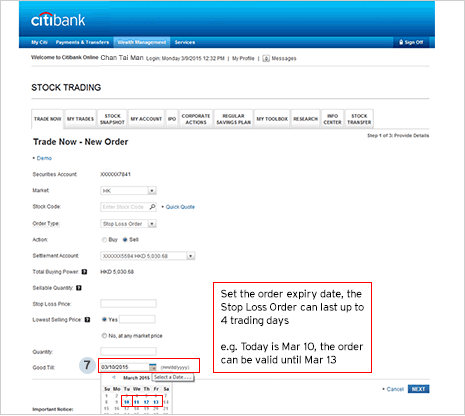 A normal order is a limit order that allows you to set a maximum price for a buy order or a minimum price for a sell order as the order price. 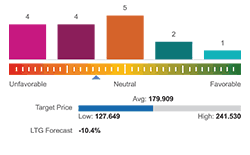 A normal buy order can only be executed at or below the set order price and a normal sell order can only be executed at or above the set order price, depending on what is best available in the market. Any unfilled portion of a normal order will be queued for matching until the relevant order expiration date. A stop loss order is a normal order that enable you to preset Stop Loss Price and Lowest Selling Price which you may place with the exchange for processing during the relevant trading session on any relevant trading day. For U.S. securities trading, the stop loss order is processed during the U.S. trading hours on any relevant U.S. trading day. 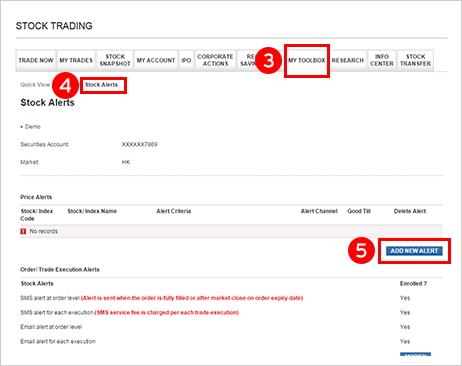 Good-Till-Date (GTD) feature is available for stop loss order in the U.S. market and it allows you to select an expiration date until which such order shall be valid so long as the Stop Loss Price has not been triggered yet. Any un-triggered order will be cancelled at the market close on the expiration date. 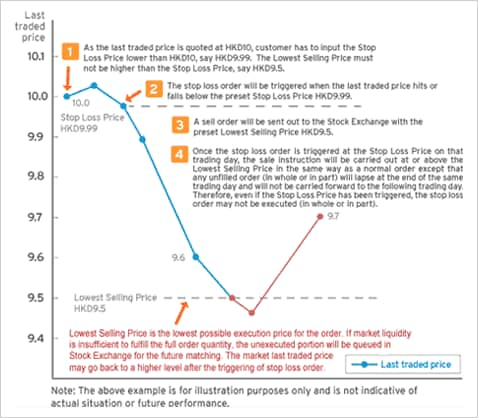 If you set the lowest selling price , once the order is triggered at the Stop Loss Price on that trading day, the sale instruction will be carried out at or above the Lowest Selling Price in the same way as a normal order except that any unfilled order (in whole or in part) will lapse at the end of the same trading day and will not be carried forward to the following trading day. Therefore, even if the Stop Loss Price has been triggered, the stop loss order may not be executed (in whole or in part). If you do not set the lowest selling price, once the order is triggered at the Stop Loss Price on that trading day, the sale instruction will be carried out in the same way as a market order at the current bid/ask price at the time when the order is triggered. The Stop Loss Price must be lower than the current bid price when the order is placed during trading hours (or the closing price when the order is placed since the market closes) and the Lowest Selling Price must not be lower than 90% of the Stop Loss Price. 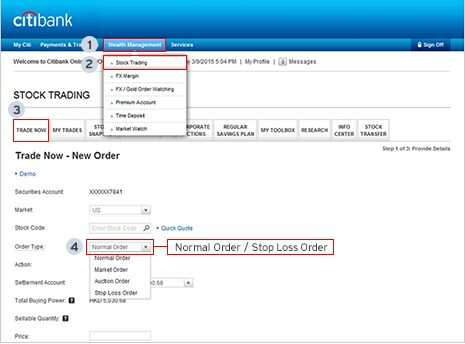 Enable you to set the order validity period for up to 4 trading days for normal order and stop loss order. 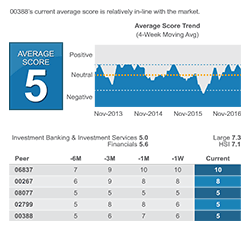 Leverage real-time international financial markets news from Dow Jones & Company Inc. Application comfirmed. Keep the “Application Reference Number” acknowledgement for future reference. 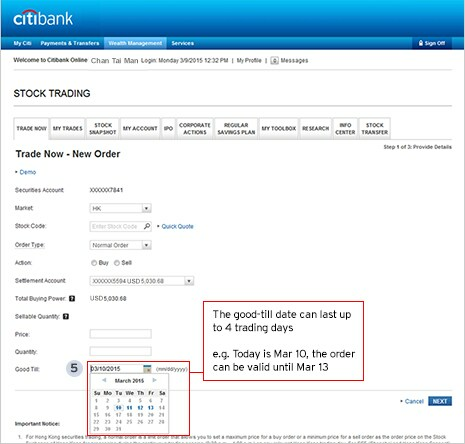 Clients (“New stock clients”) have to open a new securities account with US market services in Citibank (Hong Kong) Limited (the “Bank”) during April 1 to June 30, 2019 (the “Promotion Period”) and must not have cancelled or held any sole or joint securities account with the Bank within the past 12 months, in order to enjoy the Program. 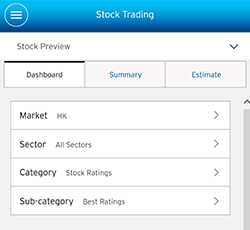 New stock clients can enjoy a flat US$18 brokerage fee for each US stock buy and sell transaction carried out via Citibank Online or Citi Mobile App Securities Services within the first 3 calendar months from account opening. The minimum brokerage fee (US$30) is waived. The Program is applicable to US stock buy and sell transactions only. Buy and sell transactions of stock in other markets, stock transfer-in and transfer-out, Initial Public Offering, Stock Regular Savings Plan related transactions are not included. New stock clients are required to pay the regular brokerage fees at the time of trading. The brokerage fee reduction amount entitled during the waiver period will be refunded to the new stock clients’ settlement account linked to the securities account within 3 months after the US stock transaction month. New stock clients should maintain a valid securities account and settlement account at the time when the refund is made. New stock clients will still be charged non-brokerage fee items such as, but not limited to, US SEC Fees, American Depository Receipt (ADR) Fee, Tax and Transfer Fee where applicable. The Bank will credit the refund amount to the New stock clients’ US Dollar settlement account. New stock clients will receive a 4% p.a. savings rate (“Bonus Interest”) on the US dollar settlement account linked to the US securities account in the next calendar month upon successful US securities account opening by fulfilling the requirements as in point number 3. The offer is only applicable to New stock clients who successfully perform at least one US stock buy/sell transaction carried out via Citibank Online or Citi Mobile App Securities Services within the first 3 calendar months of US securities account opening. Buy and sell transactions of stock in other markets, stock transfer-in and transfer-out are not included. The Bonus Interest will be calculated on the average daily balance of the respective US dollar settlement account in the next calendar month upon successful US securities account opening. The average daily balance is calculated by dividing the sum of the daily account balance by the number of calendar days of the respective month (“Average Daily Balance”). The Eligible Deposit Amount will be capped at US$200,000. The total of the Bonus Interest entitled during the Promotion Period will be credited to the respective US dollar settlement account within 3 months after the month New stock clients are eligible to the Bonus Interest (next calendar month upon successful US securities account opening). New stock clients should maintain a valid and same US securities account and US dollar settlement account from the time the US Stock buy/sell transaction is performed to the time the Bonus Interest is credited. 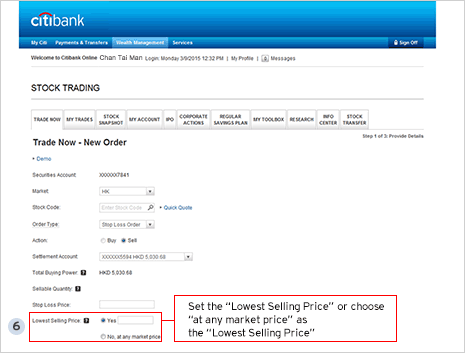 New stock clients are eligible to enjoy 0% spread for successfully executed Foreign Exchange (“FX”) spot transactions using Hong Kong Dollars to buy US Dollars via Citibank Online and Citi Mobile App under the “Currency Exchange / Trading” function executed within the first 3 calendar months from account opening (including the month of account opening). The exchange rate/pricing indicated in Citibank Online and Citi Mobile App for any particular currency pair generally includes any profit margin/spread of the Bank and New stock clients will be charged the all-inclusive price for the Eligible Transactions. An amount equivalent to the spread for the Eligible Transaction(s) will be rebated to the New stock client’s debit account (in that corresponding Sell Currency) within 3 months after the transaction month of the Currency Exchange. If there is more than 1 eligible transaction for the debit account, the lump sum amount will be rebated to the corresponding account. The Rebate will be rounded off to 2 decimal places. 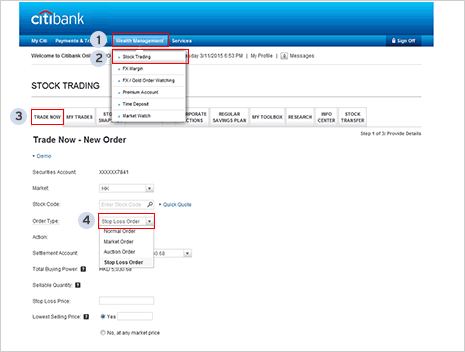 If the New stock client is no longer a customer of the Bank or the debit account is closed at the time the Rebate is made, the relevant Rebate shall be forfeited absolutely and shall not be paid to the New stock client through any other means. The eligible Currency Exchange transaction of the Promotion cannot be used in conjunction with other prevailing FX Promotion Offers and Time Deposit offers involving foreign exchange, including but not limited to Citi Mobile® App Foreign Exchange 0% Spread Promotion Offer, Citi Mobile® App FX Trading Platform Welcome Offer, Citi Mobile® App Buy Foreign Currency Earn Reward Point Offer and Citi Mobile® App Foreign Exchange (“FX”) Member-get-Member (MGM) Program. All the above offers / rewards are not applicable to clients who are employees of the Bank or Citibank N.A or its subsidiaries during the Promotion Period and at the time of crediting the rewards. These terms and conditions shall be governed in accordance with the laws of the Hong Kong SAR and the clients irrevocably submit to the non-exclusive jurisdiction of the competent court of the Hong Kong SAR. The information and data on this website is provided by third party providers. The use of any product, service or feature available through the internet Website accessible at [citibank.com.hk] (the "Website") by any user of the Website ("I") shall be governed by the following terms. The Website makes information of third parties available, including stock prices, analysts' views, company information, data about financial markets and news reports (the "Third Party Content"). I acknowledge and agree that the Third Party Content is neither created nor endorsed by any business offering products or services through it. The provision of Third Party Content is for general information only and is not intended to constitute a recommendation or solicitation to purchase or sell any security or make any other type of investment or investment decision. In addition, the Third Party Content is not intended to provide tax, legal or investment advice. I acknowledge that the Third Party Content provided to me is obtained from sources believed to be reliable but, save to the extent provided otherwise in the Terms and Conditions for Accounts and Services or other applicable terms and conditions, no guarantees are made by Citibank, the Website or the providers of the Third Party Content as to its accuracy, completeness or timeliness. I acknowledge that the Third Party Content does not take into account any views held or promulgated by Citigroup, Inc. (which may or may not have been communicated to me) and that such views may in fact be contrary to the Third Party Content. I agree not to hold the website, any business offering products or services through the Website or any provider of Third Party Content liable for any investment decision or other transaction I may make on the Website (regardless of whether or not such data is taken into account by me), or any liability that may arise due to delays or interruptions in the delivery of the Third Party Content for any reason. Citigroup Inc., its affiliates and its employees are not in the business of providing tax or legal advice to any taxpayer. THERE IS NO WARRANTY OF MERCHANTABILITY, NO WARRANTY OF FITNESS FOR PURPOSE, AND NO WARRANTY OF NON-INFRINGEMENT. THERE IS NO WARRANTY OF ANY KIND, EXPRESS OR IMPLIED, REGARDING THIRD PARTY CONTENT. Third Party Content is the property of its respective provider or its licensor and is protected by applicable copyright law. I agree not to reproduce, retransmit, disseminate, sell, distribute, publish, broadcast, circulate or commercially exploit the Third Party Content in any manner without the express written consent of the Third Party Content Provider. Nothing contained herein shall supersede, alter or nullify the terms of any other agreements I have or will make with any business providing products or services through [citibank.com.hk]. You should seek advice from your professional advisors as to your particular tax position, including but not limited to estate duty and withholding tax that might arise from investing in overseas products. This website is for information purposes only and does not constitute any offer or solicitation or advice to buy or sell any security. Investments are not bank deposits and are not obligations of, guaranteed or insured by Citibank (Hong Kong) Limited, Citibank, N.A., Citigroup Inc. or any of its affiliates or subsidiaries, or by any local government or insurance agency, and involve risks, including the possible loss of the principal amount invested. Share prices may go down as well as up. Investment products are not available for U.S. persons and might only be applicable to limited jurisdiction. Any person considering an investment should seek independent advice on the suitability or otherwise of the particular investment. Citibank (Hong Kong) Limited endeavours to ensure the accuracy and reliability of any data and information they provide but do not guarantee the accuracy or reliability of such data and information and accepts no liability (whether in tort or contract or otherwise) for any loss or damage arising from any inaccuracies or omission. The use of such data and information is at the user's sole risk. Such data and information of this website are provided for personal use only and shall not be furnished to any other person or entity for any reason. Any copying, reproduction and/or redistribution of any of the documents, data, content or materials contained on or within the Citibank Online and/or provided through the services without the express consent from Citibank (Hong Kong) Limited is strictly prohibited.